As the time passes you pleasant memories may be fade away,the picture frames are one good way to keep those sweet moments last for a long time. People prefer these modern and stylish acrylic photo frame although there are so many kinds of photo frame. 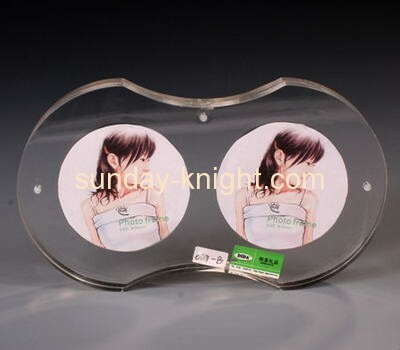 There are several feature that make acrylic photo frame well-liked by people. First, acrylic photo frame tend to satisfy people of all tastes and preferences. No matter you love classic style or edgy modern design, these fashionable acrylic photo frames can suit your taste perfectly. Acrylic is very similar to glass,it feature transparency, So with your favourite photos or poster in these stunning acrylic frame are undoubtedly attract great attention to these photos and stand out you photos in a fresh approach. You can even print your own photos onto an acrylic panel. Whether your style is classic or traditional, these acrylic photo frames can add a touch of color to your home or office, and bring your favourite images to life. Second,as we know,acrylic is one recyclable plastic material, As the society develop,people are becoming more aware of the environmental impact. So eco-friendly products are definitely welcome in people daily life. Third, acrylic photo frames are very durable. As you know ,aluminium photo frame may get dusty ,wooden photo frame and bamboo photo frame may get worm ,while glass photo frame are crystal photo frame are very fragile ,thus very easy to be broken .While these acrylic photo frame are actually very durable . While these acrylic photo frames not only last for a long time, but they are free of scratches and other cosmetic issues that can ruin the way your favorite images are displayed. As far as maintenance, acrylic photo frames require very little up keep. Forth, it is very easy to maintain the acrylic photo frame, you can wipe them with a soft cloth to clean the photo frame in warm water. Fifth, people like these acrylic photo frame is because they are pretty, cost-effective are also flexible,they are nearly uses as all framing,such as wall mounted acrylic poster frames, acrylic certificate frame.